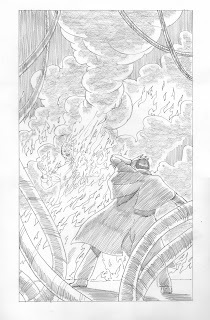 Over twenty years ago I wrote a graphic novel featuring Sherlock Holmes and Count Dracula, entitled Scarlet in Gaslight. I still vividly recall pounding out the original manuscript on my portable typewriter in my little spider haunted basement apartment in my old hometown of Louisville, Ky. The story was written mainly out of frustration as I had been unsatisfied with two previous novels from other writers, both of which I left unfinished, dealing with a similar theme. Also, this was very early in my career and I'd had a few short story anthology sales, mostly science fiction tales, which encouraged me to attempt something of greater length. After a bit of deliberating, which included the painstaking process of carefully rereading not only Bram Stoker's Dracula--but also Sir Arthur Conan Doyle's entire Sherlock Holmes Canon, consisting of four novels and fifty-six short stories, and finally, I was ready to begin. 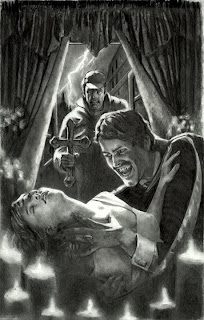 I remember the tale flowing pretty easily, tripping me up only a couple times (such as when I had to stop and figure out how Holmes was ever going to get rid of the hundreds of vampires which I'd set loose to terrorize London). Much of the story seemed to write itself and I never once felt as if I was "working". This was much too much fun for that. Once the manuscript was completed, I nervously sent it to Ray Bradbury, at his very kind invitation, and he immediately encouraged me to look for a publisher. 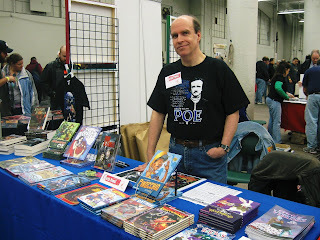 In those days before the internet, I began the comparably costly process of snail-mailing the first completed issue to every independent comic book publisher I could think of. Literally no one was interested. Usually I never even heard back from them. Still, knowing that giving up and quitting was a sure way to fail, I kept at it. I was beginning to feel like there was something very wrong with me. Suffice to say, for almost two years, I received back nary a nibble until Malibu Comics snatched it up and Scarlet in Gaslight ultimately went on to receive an Eisner Award nomination for Best Limited Series. Finally, and quite suddenly, I was off on a full-time career as a professional writer. I could hardly believe my luck. 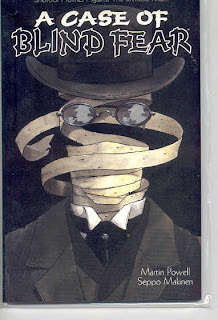 Now, toward the close of 2009, it’s amazing for me to realize that Scarlet in Gaslight is entering its sixth printing, together with the fifth printing for A Case of Blind Fear, both collected in an elegant new edition of SHERLOCK HOLMES Mysteries Volume One. 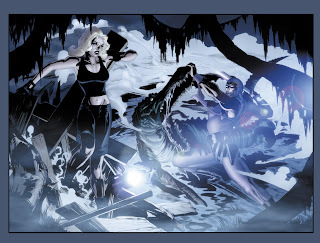 I suppose that this is no small accomplishment for two mere creator-owned mystery/adventure stories from the frantic old days of the "Black and White Glut". Even so, as I've always said, it's really Sherlock Holmes, not Martin Powell, who sells these stories. In many ways, throughout my long career, he's been my very best friend, even if I did choose to ignore that fact for a number of foolish years. I also owe a tremendous debt to Seppo Makinen’s brilliant illustrations, to Joe Gentile at Moonstone for continuing to carry the torch, and for the late, great Don Thompson of the legendary Comic Buyer's Guide, for his inspiring early endorsements. Over the past several years, I’ve grown considerably in my affection for Scarlet in Gaslight and A Case of Blind Fear . And, hopefully, the Great Detective will continue to allow me to share in his adventures for a long time to come. 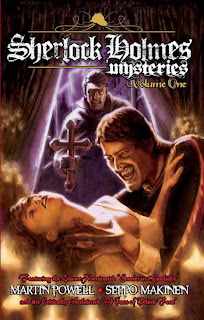 SHERLOCK HOLMES Mysteries Volume One will be on sale around Valentine's Day 2010. I ventured out into the Christmas blizzard to see the new movie yesterday afternoon, and I must confess that I loved it. This is an excellent Sherlock Holmes film, and one of the very best in depicting his brilliant lightning fast brain. 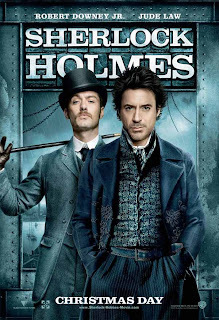 While Robert Downey, Jr. is physically rather unlike the literary detective, his superb performance convinced me, in mere minutes, that I was indeed watching Sherlock Holmes. 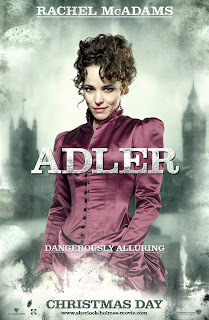 Jude Law is a very capable Dr. Watson, and Rachael McAdams' presentation of "The Woman", Irene Alder, while not exactly Canonical, is my favorite version of her character on the screen so far. Director Guy Richie's breathtaking recreation of 1890 London oozes with foggy atmosphere and looming thunderstorms. It is a beautifully dangerous-looking place. The mystery itself is clever and epic in its construction. As a special innovative bonus, Richie allows us inside the Great Detective's mind during his rapid-fire observations and deductions. The result is dazzling. 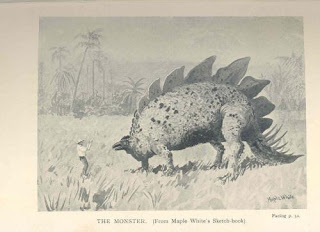 Besides Holmes' physical prowess--something actually described by Sir Arthur Conan Doyle in many of the original tales--I could not help but be astonished by the hero's mighty brain as well. Regardless of what some unknowing reviewers may say, along with certain self-proclaimed Sherlockians who'll wildly criticize the film without seeing it, this is Sherlock Holmes. And it's a grand incarnation. They are really missing something special. I fully intend to see the movie again before it leaves the theater. The sold-out audience was completely and positively involved from the very start, and were obviously delighted with the film. This was probably Holmes 101 for most of them and I think it's a very fine introduction to the classic character. I don't consider it much of a gamble for me to predict that this will easily be the highest grossing Sherlock Holmes film in cinema history. At least, until the release of the sequel (with Professor Moriarty!) which is already in the works. I had a touch of the holiday blues, as usual, before seeing it, but now I'm quite fine. Once again, Sherlock Holmes has saved me. Every movie isn't everyone's cup of tea (I detested Titanic), but--as a Sherlock Holmes writer of two decades (and life-long fan)--I give the new film full marks. This is my favorite Christmas present of 2009. 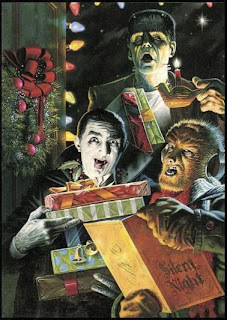 And to All a Ghoul Night! The Return of SHERLOCK HOLMES! 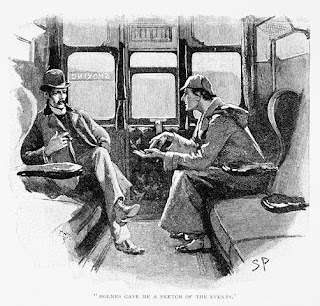 Sherlock Holmes is such a fabulous character that his own creator, Sir Arthur Conan Doyle--even after four novels and fifty-six short stories--didn't even begin to exhaust his possibilities. 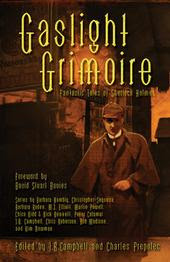 The Great Detective returns in 2010, in a new prose anthology from Moonstone, co-edited by Joe Gentile and yours truly. My own professional history with Sherlock Holmes is a long one. Sometimes it's hard for me to believe that it's been over twenty years since I wrote Scarlet in Gaslight, feverishly thrashing out the manuscript on my old portable typewriter in my crappy little basement apartment in Louisville, Ky. After gaining some generous insight and encouragement from Ray Bradbury, I began sending out the story to every appropriate publisher I could think of, and patience finally did the rest. Ultimately, about two years later Malibu Comics snatched it up, and the story no one else seemed to want went on to receive an Eisner Award nomination. 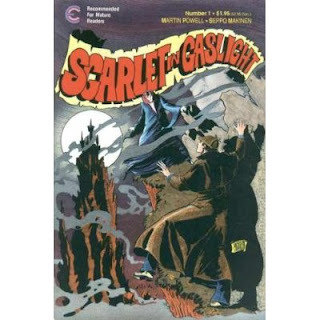 Plus, Scarlet in Gaslight has since gone through five different printings, from various publishers, with a sixth from Moonstone itself just around the corner. 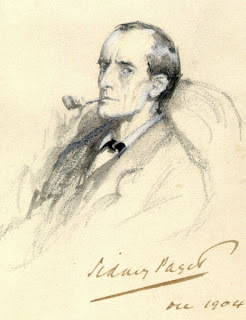 I was to write several more stories of Baker Street's most famous resident in the years to follow, and--happily--there appears to be no end in sight. 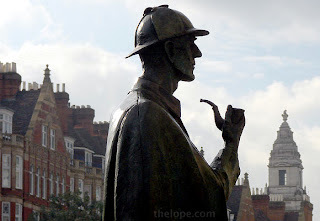 Then, when Joe Gentile approached me about co-editing, and contributing, to a brand new Sherlock Holmes anthology, some months ago, you can probably imagine my enthusiasm from the start. It was especially thrilling for me that I was responsible for choosing about half of the authors myself, plus I was encouraged to help shape this book in the particular image I wanted. Mind you, this won't be a typical standard collection of Holmesian tales. There is an abundance of such volumes already available from other publishers, and many of them are very good indeed, but I wanted this one to be unique and I purposely hand-picked the very best available writers I could toward those ends. There's still a lot I can't yet say about this massive, extremely exciting project. 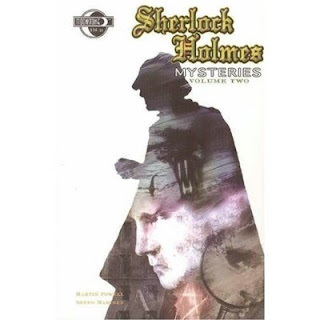 I can relate that all of our esteemed authors have enthusiastically leaped at the chance to write Sherlock Holmes, especially once they learned of the peculiar theme of this very special anthology. We're even already considering doing a second volume to contain the abundance of imaginative wealth that keeps pouring in. Joe and I been moving very slowly so far, allowing our contributors the necessary time to free up their schedules (including the snail's pace that the Holiday Season always seem to bring), but we're nearly ready to go and I'll be spilling the whole thing here on my blog, and on Facebook, shortly after the start of the New Year. It has been a tremendous joy dealing with these amazingly creative men and women, most of whom I didn't know personally, except through their own fantastic fiction. A wonderful unforeseen bonus included in this project has been that some splendid friendships have developed as a result. I'm extremely grateful for that, as these newly found relationships have made my life much richer. Once again, I owe it all to Sherlock Holmes. Amazon is nortoriously slow about making additions or corrections to my Author's Page, but here it is in case anyone would like to peruse. 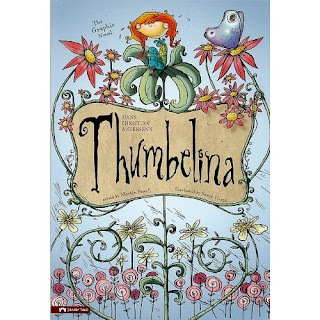 Great new review of my recently published children's book, THUMBELINA! 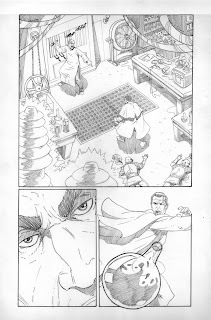 I just received the very welcome news that the new printing of my graphic novel collection, SHERLOCK HOLMES MYSTERIES Volume One, has more than made Diamond's rather strict order requirements. This book will contain both Scarlet in Gaslight & A Case of Blind Fear (for their 6th and 5th printings, respectively) and a brilliant new cover painting by Gary Carbon. The publisher is Moonstone. There may be new interior extras, too. Will let you know when I find out. Close on the heels of that brand new edition, Moonstone is also offering its companion tome, SHERLOCK HOLMES MYSTERIES Volume Two again. This book contains my graphic novels The Return of the Devil & The Loch Ness Horror, both, of course, starring the Great Detective. 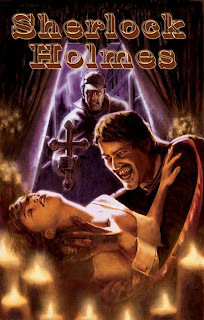 So far, that's five of my own Sherlock Holmes tales reappearing in 2010...with two new Holmes projects in the works, as well. Here's a secret sneak peek at one of them. Thanks to everyone for their enthusiastic orders and please stay tuned! Sherlock Holmes in the Lost World...Returns! 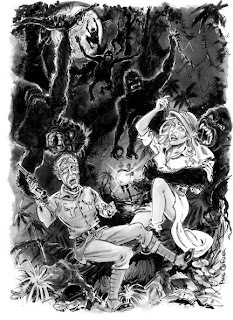 Just received confirmation that my adventure/mystery tale Sherlock Holmes in the Lost World (first published last year in the excellent Gaslight Grimoire), will now reappear in a longer novella form, in a new Sherlock Holmes anthology from a different publisher in 2010! More details soon as I'm allowed to post them. 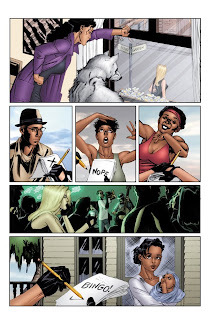 The art on the first issue of THE PHANTOM UNMASKED, is now complete. 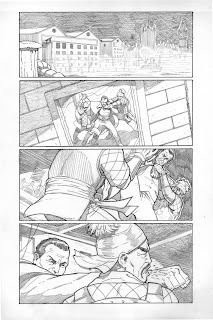 Here are a few sample pages (minus my clutter of dialogue), with pencils & inks by the incredible Hannibal King, and colored by the amazing Andrew Dalhouse. The series will be published by Moonstone. 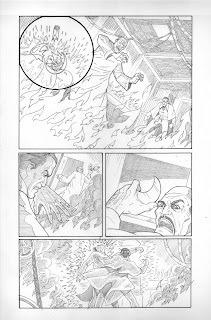 Check Previews, as I believe issue number one will be solicited very soon. 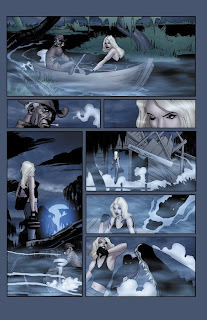 I wrote this Phantom mini-series as a sort of homage to the suspenseful pace of Alfred Hitchcock, full of twists, turns, and mystery, I included, of course, a brilliant, and beautiful, icy blonde protagonist. Hannibal and Andrew have added to that atmosphere perfectly. Thanks guys. Hannibal is currently hard at work, illustrating my concluding script. I'll be posting pages from that issue, as well.